(CNN) – If the number of Facebook fans a candidate has can be seen as a leading indicator to the outcome of a race, the Republicans are in for a big win tonight. Republican candidates are beating Democratic candidates by a better than two-to-one margin in the number of Facebook fans as of Election Day. Seventeen celebrities have joined together with comedy site Funny or Die to encourage the age demographic that most watches viral videos to go out and vote on Election Day.The stars include former Obama White House staffer Kal Penn, Aziz Ansari, Donald Glover, Alyssa Milano and Criss Angel. The video, which was released on Thursday and is titled "10 minutes," tells Americans voting is easy and only takes 10 minutes. "It was a bi-partisan effort to get out the vote because so many people in our audience of young people are apathetic about the mid-term elections," Mike Farah, Funny Or Die's president of production, told CNN. New York (CNN)–When pulling the lever on Election Day, Foursquare users can "check in" and receive a special badge the company announced on Wednesday. Foursquare, a location-based mobile application that lets users "check in" to venues and compete for virtual badges, unveiled their "I Voted" badge. Washington (CNN) - For employees inside the White House, wasting time on Facebook is not an option. "You cannot get on Facebook at the White House," Council of Economic Advisers chairman Austan Goolsbee told CNN Money's Managing Editor Lex Haris during an interview. Ironically, Haris was interviewing Goolsbee during the weekly White House "Open for Questions" session that was streamed on the White House Facebook page where users could also submit questions live on the social network. (CNN) - Carly Fiorina's campaign launched a new interactive iPhone application and game to engage younger voters and capitalize on the recent trend of location-based social networks. The "Carly Fiorina Red Zone Challenge" is a location-based app that allows students, fans and friends of California colleges to earn points and compete against each other by "checking in" at locations including rallies, phone banks, and other get-out-the-vote events and activities. Washington (CNN) - The National Republican Senatorial Committee updated its iPhone application to include a "Take Action" section, allowing users to capture every moment on the campaign trail and increase their chances of going viral. During the 2006 midterm election season, then-Virginia Republican Sen. George Allen was captured on camera using the derogative term "Macaca" to describe the cameraperson. The video was placed on YouTube and quickly went viral, being viewed by millions. Allen did not win re-election and many blame that viral video. The candidates with the most Facebook fans won big Tuesday night. (CNN) - In what’s becoming a trend, candidates who have more fans on Facebook win on election night. Almost every winner in Tuesday night's primaries dominated over their losing opponents on Facebook. In the Delaware Republican Senate primary race, Christine O'Donnell's Facebook page had four times more fans than Rep. Mike Castle's page, 9,883 to 2,453. 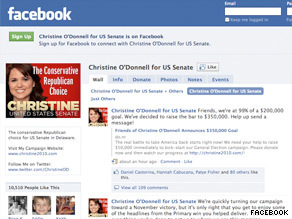 O'Donnell leveraged the Facebook platform better as well, by posting campaign updates and voting information more frequently. In Washington, D.C.'s mayoral primary race, City Council Chairman Vince Gray's Facebook page has twice as many fans as Mayor Adrian Fenty's page, 4,523 to 2,008. Thirty of the largest youth groups in America have joined together to create the Vote Again 2010 campaign. (CNN) - Thirty of the largest youth groups in America have joined together to create the Vote Again 2010 campaign, a non-partisan coalition encouraging youth voter turnout for the midterm elections. The organizations include Rock the Vote, League of Young Voters, Head Count, Campus Progress, Voto Latino and the Energy Action Coalition. To encourage 18 to 30 year olds to vote, the organization brought in three of the most influential stars in social media to create a competition around creating the best YouTube video about getting involved in the political process. Brittani Taylor , one of the 50 most subscribed people on YouTube, Tay Zonday, whose YouTube hit "chocolate rain" is one of the top watched videos with over 53 million views, and Jason Pollock, rated one of the most influential people on Twitter, created a YouTube video to in an effort to make voting go viral. (CNN) - In what is becoming a regular occurrence at the White House, a senior adviser will answer questions submitted via YouTube after the president's Oval Office address Tuesday night. Deputy national security adviser for strategic communications Ben Rhodes will answer questions submitted by the public on YouTube. Users of the site have voted on their favorites and Rhodes will answer the questions that received the most votes. "The Open for Questions live chats are an increasingly popular and effective way for the Administration to create a online dialogue between senior officials and Americans across the country about issues they care about, such as the end of combat operations in Iraq," White House director of new media Macon Phillips told CNN. This is not the first time the White House has used YouTube to solicit and then answer questions on major topics. White House press secretary Robert Gibbs participated in one after Gulf oil spill, and former White House communications director Anita Dunn answered questions after Obama's speech to the Join Session of Congress regarding health care. The president himself has even participated in one of the sessions.